As the name implies, here's my version of a California burger. 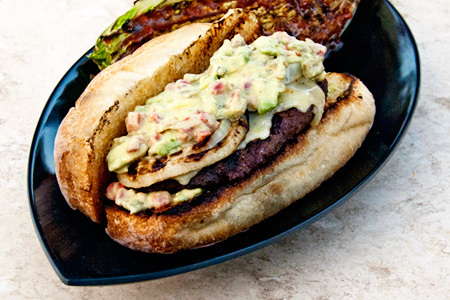 It's a half-pound burger on a rustic roll, topped with melted pepper-jack cheese, grilled onion slices, and lots of chunky funky guacamole. I'll admit that, seasonally speaking, this is probably a little premature, but the mood hit me and I went with it. Combine all of guacamole ingredients in a medium mixing bowl, stir well, and refrigerate at least one hour. Put the beef, steak seasoning, soy sauce and water in a large mixing bowl. Use your hands to mix the ingredients very well. Yes, it'll be messy. 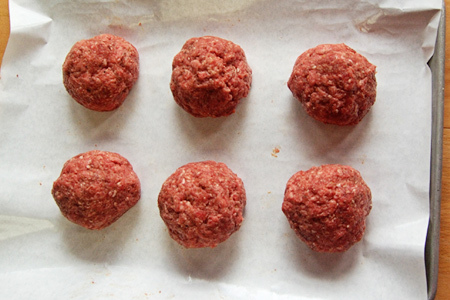 Divide the meat into six equal portions and form them into evenly-sized balls. Gently roll each ball between your hands to form a log shape about four inches long. Lay the log on wax or butcher paper and press to form a long patty about 2 1/2" wide, 5 inches long, and 1/2" thick. 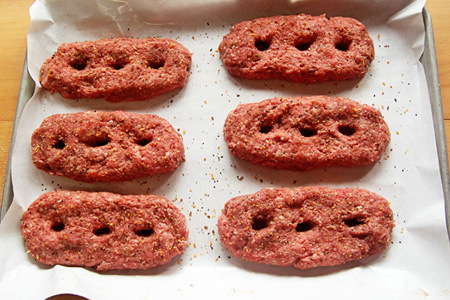 Use your index finger to put three holes evenly spaced lengthwise along the center of each patty and set them aside. Lightly oil both side of each onion slice. Grill the onions over direct heat for about two minutes per side, then move them to the cooler side of the grill. Lightly oil both sides of each burger. Grill the burgers over direct heat for three minutes, then flip them and cook another three minutes. Move the burgers to the cooler side of the grill and top each with two slices of the cheese and two grilled onion slices. Toast the rolls over direct heat. Smear the lower half of each roll with about a tablespoon of the gaucamole, add a burger, then top with another 3 tablespoons of guacamole. Grubbin! Hey John, we're getting towards spring everyday - I need some good recipes for burgers from one of my favorite bloggers! Spring time here in California! 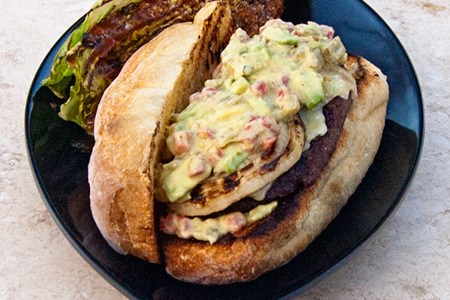 Great recipe for a burger that I love! I look forward to trying this, especially the guac. I bet you can only eat one of these at a time, they are huge! When the mood strikes - just go with it. This looks ridiculously tasty. Just made these tonight. They were some of the best burgers we've ever had. Delicious!